MatchTheMemory.com is a fun game that lets you upload your own pictures into a Concentration-style game that you can share with friends and family. Sometimes you come across a Match The Memory game that has too many cards for you to complete at once. 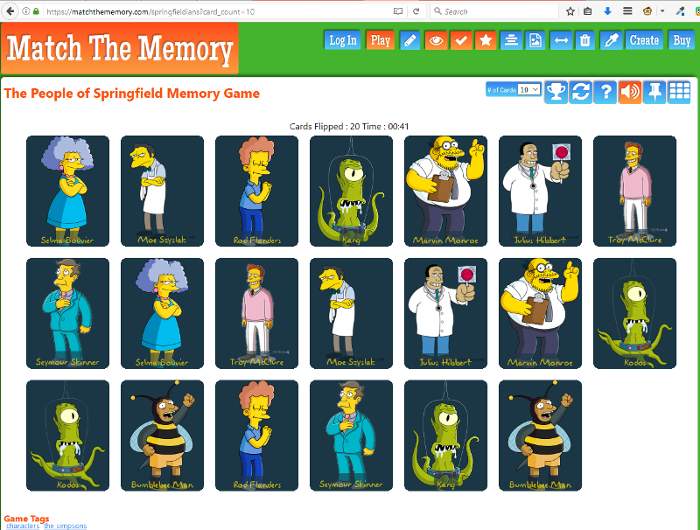 Theoretically, you could match all 118 elements on our Periodic Table memory game, or all 50 US states in our states shapes game, or even all 58 denizens of Springfield, USA, but it would probably take you a long time. We have a feature that lets you bite-size any game. We call it the “card count” feature, and it shows up in the top right corner of each game. By default, when you come to play one of our memory games, you get all of that game’s cards. But at any point in the game play, you can decide to use fewer cards. Just use the “# of Cards” dropdown and select a lower number. Boom, you’re playing a much easier version of the game. The Match The Memory system randomly chooses that number of cards, along with their correct matches. 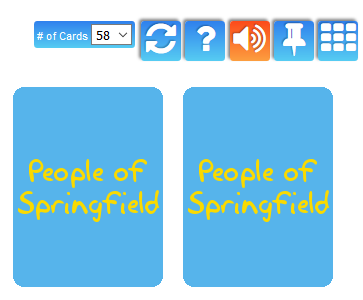 In this People of Springfield example, I picked a much more manageable 10 cards, for a total of 20 matches. You’ll notice in the screenshot above that the URL changes to show how many cards you selected. You can link to a version of the game that has as many cards as you want by adding a query parameter to the URL. So a chemistry teacher can give her class a big challenge by linking to the full https://matchthememory.com/PeriodicTableAll web site address, or make the game a bit easier for the students by sending them to https://matchthememory.com/PeriodicTableAll?card_count=10 , where they’ll only get 10 different chemical elements.